Racing and freestyle quads are mostly using carbon fiber CNC’d plates–the lighter the better. However, mechanical properties also need to be present in order to hold everything together while flying. We keep trying to push the limits of technology further. Making a drone big enough for a person to sit in is on everyone's mind. Though, there is a workaround called FPV (First Person View) which allows you to feel like you are in the driver seat of a five-inch quadcopter while racing, freestyle flying and even long-range flights. I have seen a couple pioneers 3D printing frames and components, but the material selection available to them is limited to PLA and ABS. These materials are great for prototyping and while they have a purpose, when you analyze the level of performance needed for this application such as impact strength, rigidity, weight, etc. you begin to increase mass and hardware which negatively impacts performance. The material we chose for this application is none other than the new Nylon 12CF. Tapping into the composites world but still using a thermoplastic like Nylon 12 as a carrier, creates a very strong and lightweight material catered to tooling, fixturing and prototyping heavy loads and harsh environments. Most frames today are either a single bottom plate, which has the arms and body hold the motors and electronics, or a modular approach, in which hardware is used to fix the arms to the body. Unibody will be lighter, but in the event of a broken arm, the entire bottom plate needs to be replaced. Since we are 3D printing, we are going make a unibody bottom plate with features that cannot be utilized in traditional manufacturing. We chose a unibody bottom plate to minimize weight and a modular top plate. The main material used in the frame is Nylon 12CF for the strength, rigidity and lightweight properties. 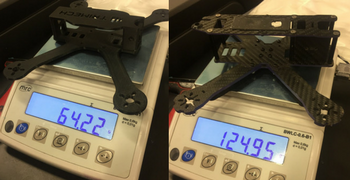 We have incorporated a Desktop Metal 4140 Chromoly sparse interior front brace to be the cage for our FPV camera, and since we do plan to fly and crash, this should be more than enough strength to take the abuse. Using the state of the art software these systems have, we were able to setup these prints quickly. We set up the Nylon 12CF part on the Fortus 450mc and the rubber pad on the 500 Connex3. Deploying Insight Software from within GrabCAD let me modify the print pattern to align rasters and apply multiple contours on areas where I need the strength like mounting holes, entire outer perimeter and bottom ribs. 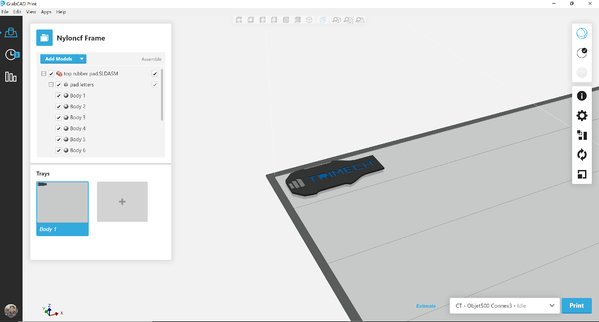 Selecting multiple materials within GrabCAD Print, I was able to handpick a Shore A40 material for the rubber section, TriMech Blue for the lettering and a slightly darker gray for the TriMech logo, which by the way is Shore A60. I immediately know the print time and cost by estimating before I send the file over to be printed. 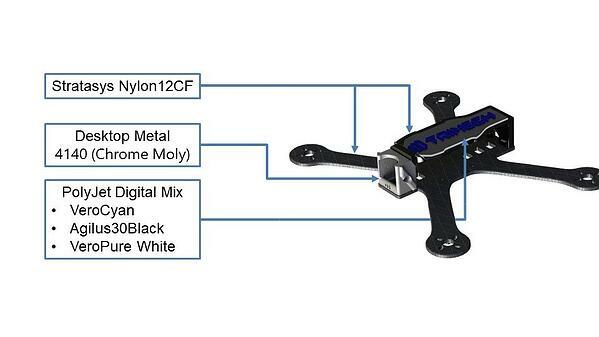 Want to learn more about which Stratasys 3D printing material is right for your application? 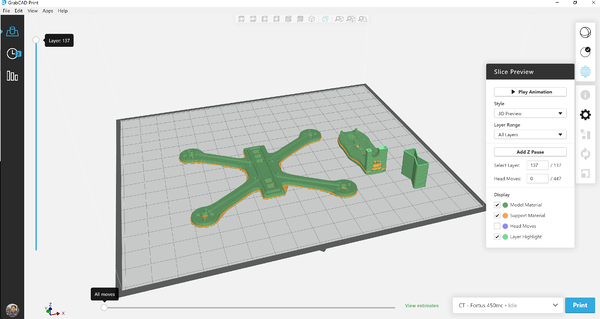 Download our High Performance 3D Printer Material Guide below.